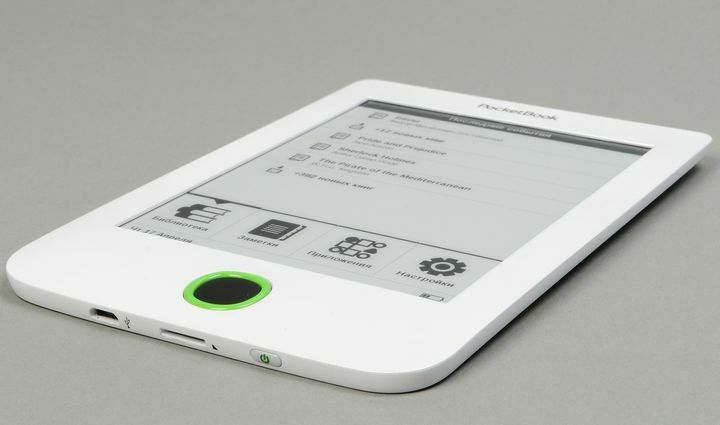 Very long time Barnes & Noble was the only company that was a real competition on the world market Amazon E Ink reader. 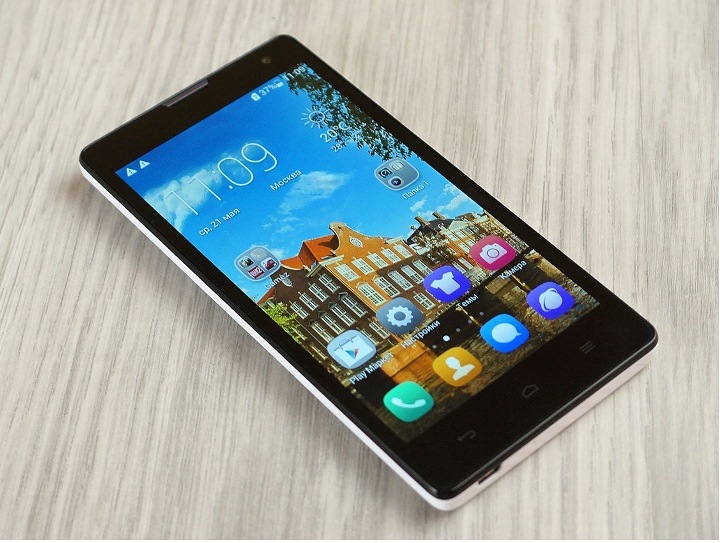 Devices from this manufacturer have always been special design, original design solutions, support popular formats EPUB, the presence of slot for memory cards and other useful features. NOOK first appeared in front of the screen lights. 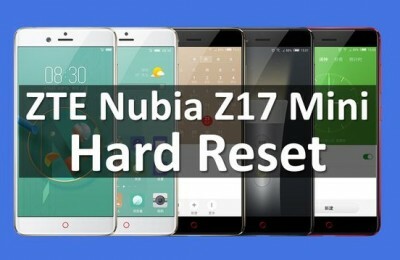 Operating system based on Android allows enthusiasts to fine-tune the software environment for themselves, avoiding artificial restrictions producer. 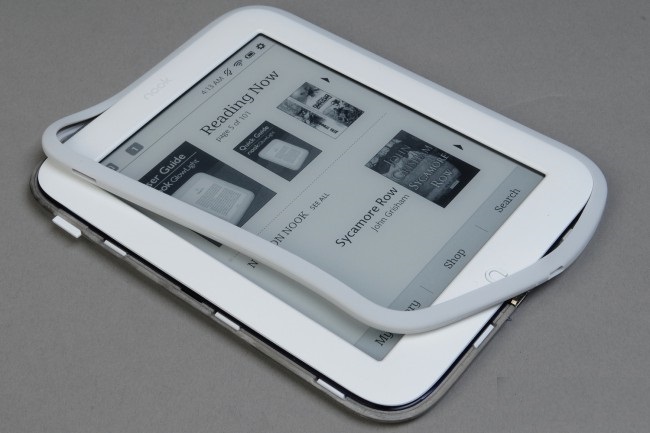 However, this year the company took a step back, releasing a simplified and less functional version of his own model of the previous generation, and not expected by fans of rival Amazon Paperwhite 2013. 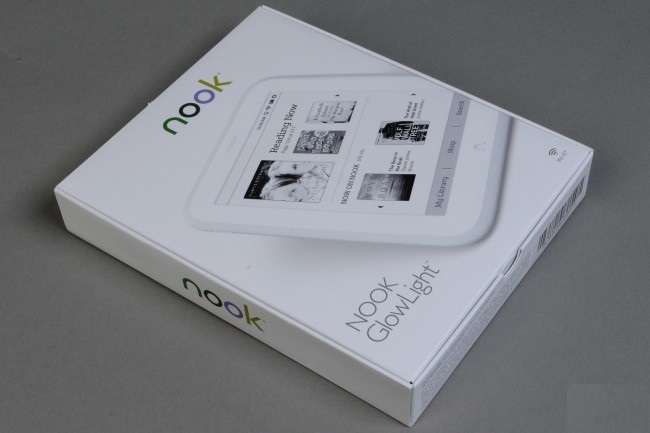 NOOK GlowLight reader comes in black and white cardboard box, one side of which hints of a read mode in the dark. The inside of the packaging completely glued foam carved niches under the reader and USB-cable white. Corporate power supply unit is not supplied, but if you want you can buy it separately for $ 10. For some money also encouraged to purchase a gray, purple or red polyurethane cover Clip Cover. She attached a special bracket to left side of the reader, it only protects the front panel and is able to fold into a characteristic triangular stand. However, judging by the responses of the real owners ( currently 11 out of 11 people unanimously put 1 point from a possible 5 ), this company has turned accessory not the best. 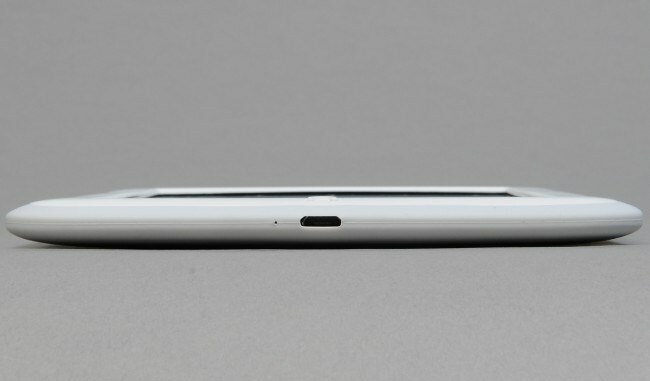 When resemblance with Apple’s Smart Cover, this cover is not able to awaken the device using the built-in magnets. Her right side is not attached to the reader, allowing uncontrolled open the bag while carrying. Absence of a channel above the key N leads to the fact that this button is pressed continuously, up to activate the backlight. We were unable to verify personally the cover, but such unanimity in a review says a lot. 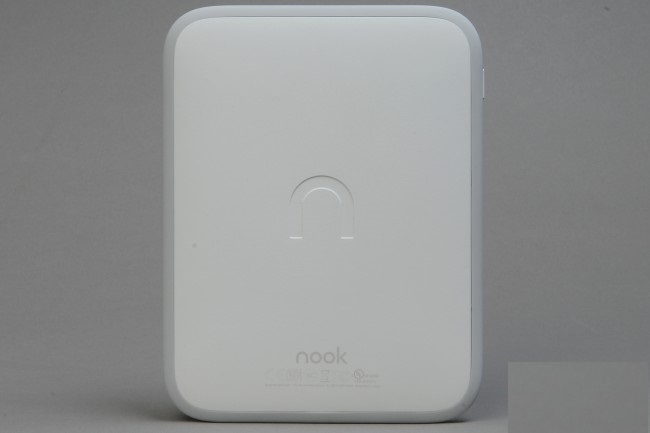 New NOOK GlowLight made in substantially revised compared to its predecessors design. Housing now white with gray piping, and not dark gray, the back panel has remained without a brand and deepening the original power button, well and most importantly – the reader has lost the memory card slot and dual buttons turn pages! Dimensions of the front panel is the same, but the thickness and weight decreased significantly, the novelty weighs only 175 grams. 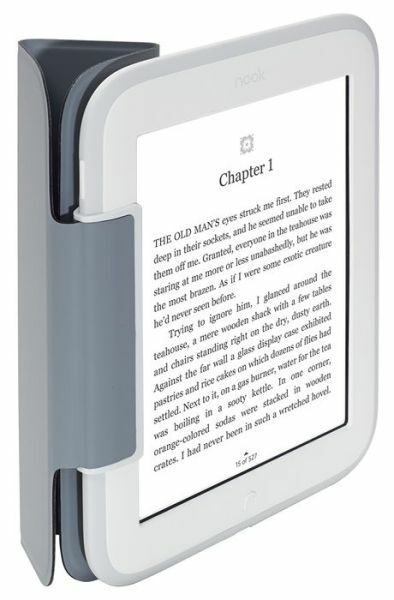 NOOK GlowLight front panel with rounded corners made of soft-touch white plastic with a matte finish. Choice of color is not the best, as his background matrix E Ink looks frankly gray version with a dark frame looks more attractive. 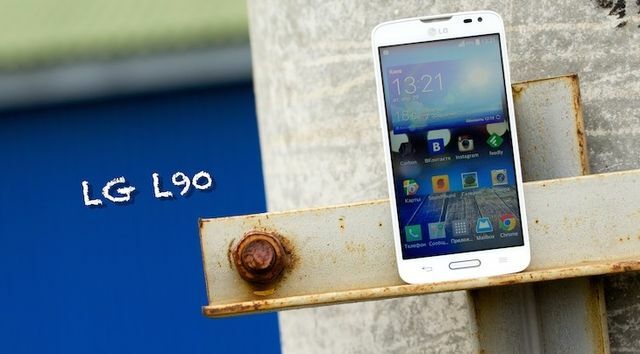 The upper border of the screen can be found a family name and the bottom – in the hardware button Home stylized form part of the first letter of the logo. Sidewall reader trimmed slip silicone frame, which at first glance, just not too tight to the body, but actually not in any way attached to it. How practical this decision will only long-term operation, but at least the impression of structural integrity of such a step affected. 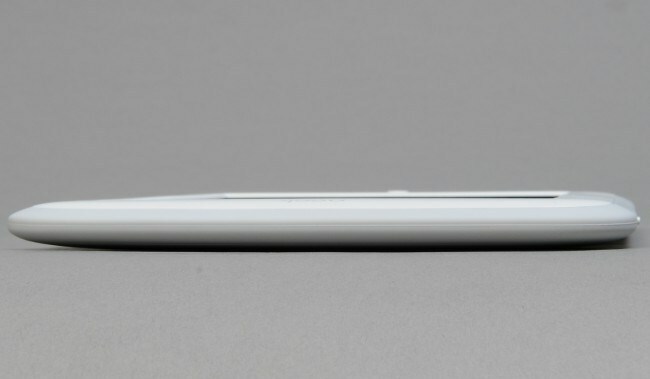 Under silicone slotted sidewalls can find the power button (top left) and a single micro-USB connector with an activity indicator (bottom). Finally back panel contains only official information and concave logo NOOK. As you can see, in terms of controls and connectors reader incredibly simple – just two buttons and a single connector. Judging by the way things are going, an audio output and a slot for memory cards into the reader from the market leaders have to forget. Three previous generation of readers from Barnes & Noble equipped with screens with a resolution of 800 by 600 pixels and only the new NOOK GlowLight finally got fresher matrix E Ink Pearl HD 1024 at 758 points. As you may recall, Amazon obtained exclusive rights to use the screens of the latest generation E Ink Carta, so developers Barnes & Noble is not physically able to use the matrix. Likely to rely on her appearance in the Reader NOOK is only in the next year, when the next Paperwhite go to the newest matrix E Ink Carta HD (300 PPI). 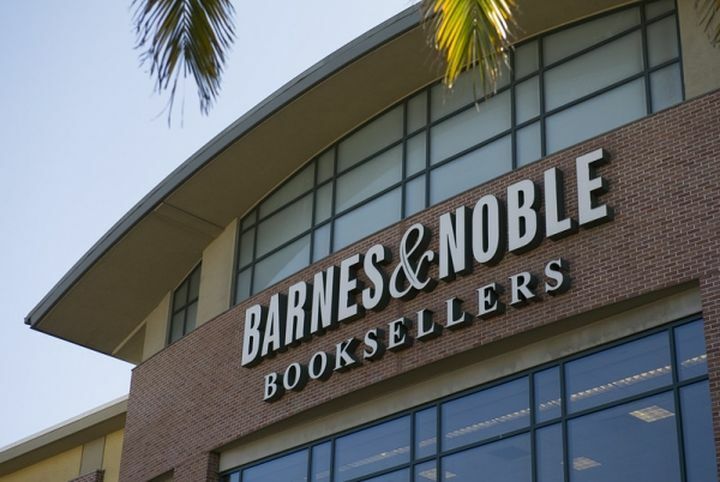 Thus, the image quality from the new Barnes & Noble is on a par with the flagship readers most manufacturers, second only to the above-named Amazon Kindle Paperwhite. Built-in lights GlowLight implemented typical E Ink reader a way that highlights the row of LEDs end special film-fiber. In our case it is five LEDs mounted above the upper edge of the screen, which is very evident on small shaded areas in this field. In other parts of the screen hue and uniform illumination intensity, the claims we did not have. 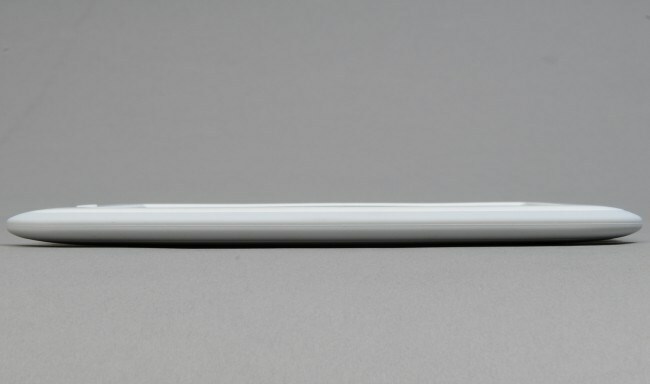 The manufacturer also mentions the presence of an additional anti-glare filter to read in direct sunlight. 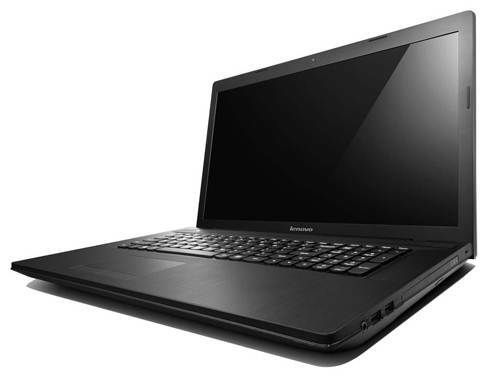 The backlight can be turned on using the interface or two-second holding down Home, its intensity is adjusted by moving the slider in the range of 1 to 150 cd/m2. Unlike Amazon Paperwhite, GlowLight lights switched off completely, by removing the tick from the appropriate menu item. 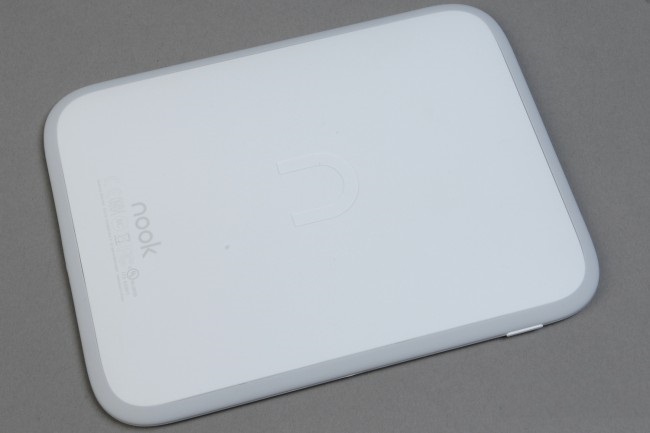 Reader Barnes & Noble NOOK GlowLight equipped with an infrared sensor unit, causing the matrix had lower significantly below the plane in the front panel. It is because of this feature, some users prefer capacitive screens, but on the eve of the winter infrared sensor type looks more practical, as it allows turning the pages, even with gloves. Manufacturers traditionally reader does not disclose the detailed specifications of the models was no exception and Barnes & Noble. It is known that the reader NOOK GlowLight built on economical single-core processor with an operating frequency of 800 MHz and equipped with 256 MB of RAM and Wi-Fi module 802.11b/g/n. 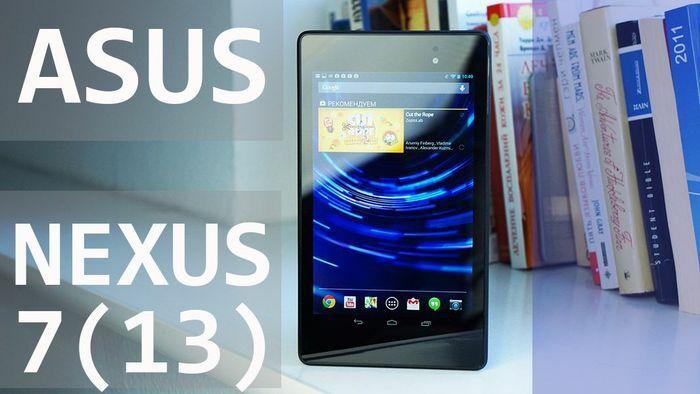 Configuration with 3G-modem, as its main competitor Amazon Paperwhite, does not currently exist. 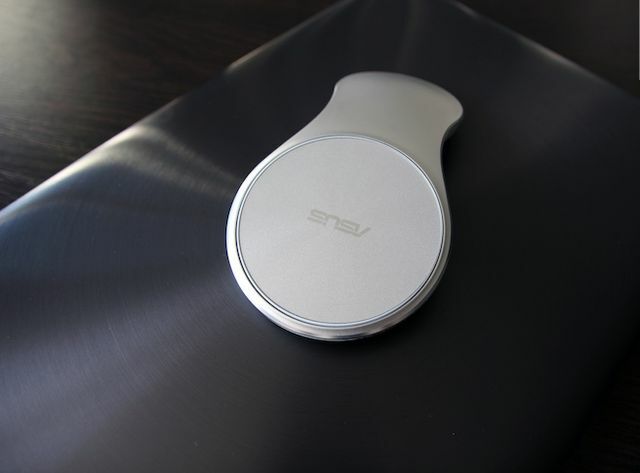 Built-in battery 5.6 Wh (1530 mAh, 3.7 V) provides up to 8 weeks of battery life, provided a half hour of reading per day and off the backlight when the wireless module. Internal memory capacity is 4 GB, but this volume available to the user only 500 MB (!) As 1.5GB used by system and another 2 GB is reserved for content purchased from the online store Barnes & Noble. 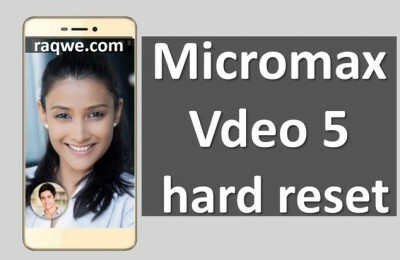 Recall that about the same situation was observed in the case with its predecessor, which at 2 GB of internal memory provides users with only 250 MB of personal space, but can significantly increase the capacity by using memory cards. The main book format NOOK GlowLight still stands EPUB, PDF, and also supports image files JPG, GIF, PNG, BMP. 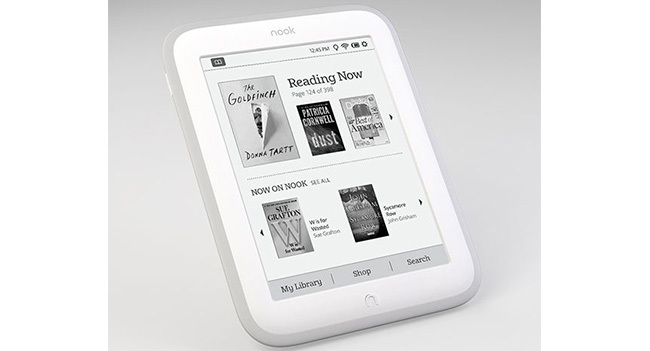 Powered reader NOOK GlowLight running proprietary system based on Android 2.X, which inspires hope for the emergence of a serious alternative firmware from enthusiasts. In sleep mode, the screen displays NOOK GlowLight stylized trees or old-fashioned collection of famous authors. 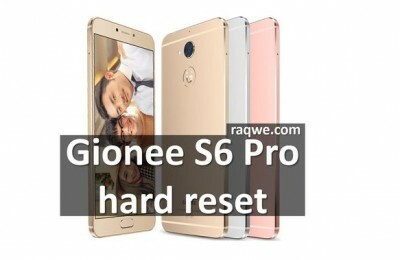 To unlock the screen is not enough simply to press the power button or press Home, additionally have to hold your finger on the bottom. Simple graphic user interface is designed for touch use, and the only control Home button functions as a return to the main window. Despite the lack of a Back button, you can replace swipe from left to right on the top line performance. More information about the book is available by double tapa on the file and need to reboot hold the power button for at least 20 seconds. Top line interface occupy office icons on the left is a link quickly jump to the last book and the notice and the right – watch, lights, Wi-Fi, and battery settings. 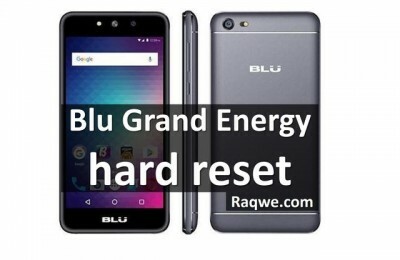 By tap into the right corner, you can call an information panel with battery level in percentage, the wireless network name, the backlight brightness level slider GlowLight and link to the section settings. The latter contains surprisingly few points that let you customize the most essential parameters like the system time, the transition to sleep mode (2, 5, 15 or 60 minutes), and enter your billing information and social accounts. Here you can quickly check the battery and the amount of free space in the data store. The top of the main window displayed cover last opened books indicating progress reading below offer you a list of the most interesting books in the online shop Barnes & Noble. Finally, the bottom line of the main window contains three tabs: My Library, Shop and Search. The last two points are not very interesting for a detailed review, but the local library is interesting ample opportunities groups (All, Books, Magazines, Shelves, and Other Files), sorting (Last, Title, Author) and display mode (Covers or List). While reading, you are alone with the text and reading progress in the form of current / last page of the book, the name of which you only see up to the first turning. 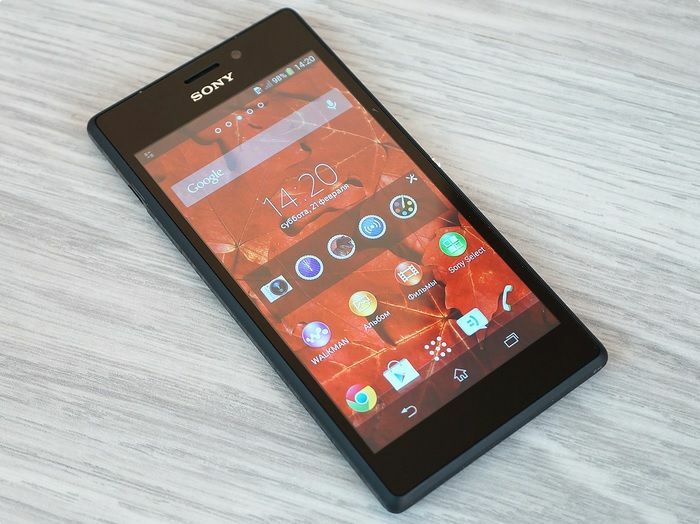 In the absence of hardware buttons only have to do it using the touch screen – touch to the right or left side of the page or habitual “flipping” gesture. Tab can be left touching the upper right corner. 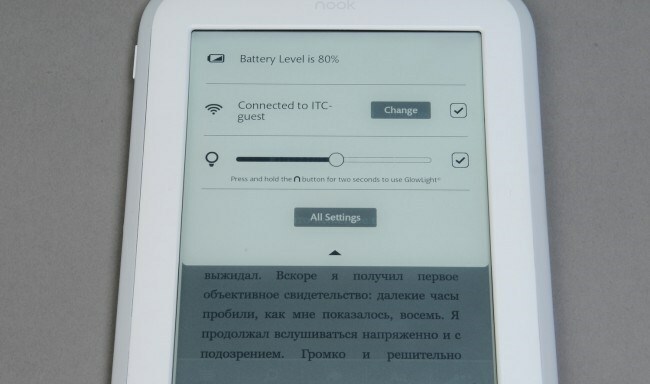 By tap on the center of the screen NOOK GlowLight bar appears on official pictograms above (title of the book, clock, lights, bookmarks) and sub-menu below. Content section contains a list of chapters of the book records and bookmarks. Search allows you to find the desired word in the book, although in the absence of a Cyrillic keyboard, this function is practically useless. On the Go menu, you can learn within which chapter you are in, the number of pages before it is finished and quickly go to the right place books, guided “by eye” with the analog slider or specify a specific page number. If the result of the transition you do not accept, you can immediately go back to using a single button. More section allows you specify the parameters of a book file, including size, location, and date of creation. And finally, the most interesting for the reader to the setting item text includes seven sizes of characters, six font types and three variants of line spacing and margin width. Interestingly, for the PDF-files available only changing the font size, other parameters like scaling or cropping fields are absent. Also note that the reader is not possible to rotate the text in landscape orientation, have read books in the only accessible portrait position. 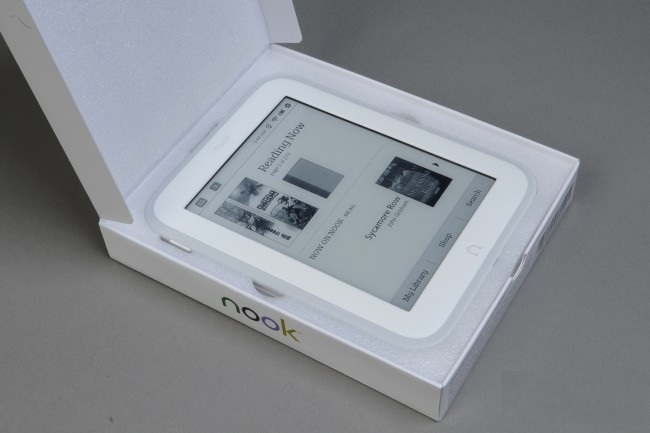 During the operation of the new NOOK main claim has caused the rejection of hardware keys to scroll, no memory card slot, and white edging screen, subjectively reduces image contrast. 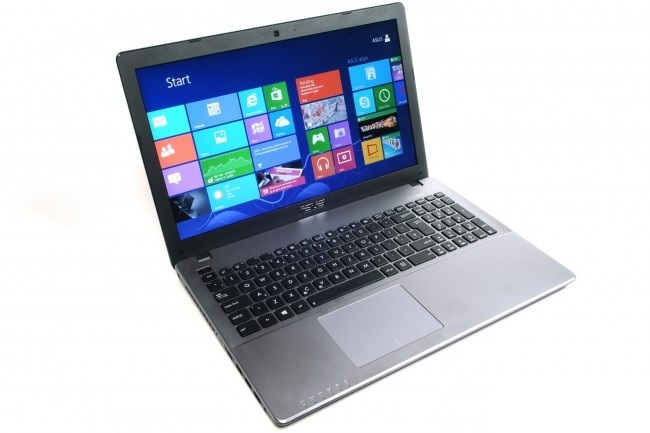 Like the screen with HD-resolution sufficiently uniform bright lights, and the minimum weight and a fresh new design. Interestingly, the NOOK GlowLight completely missing the opportunity to control the way a page refresh, options like forced ezhestranichnogo full upgrade or the number of pages after which it occurs simply not on the menu. Instead, it uses a specific algorithm without regular black background fill where the symbols characteristic twitch when turning. Apparently at this moment occurs address inverting symbols outgoing pages, and so there is no accumulation of critical artifacts. For those who are particularly concerned about this situation, we note that a full page refresh still occurs, but only when the lock screen, or return to the main menu. 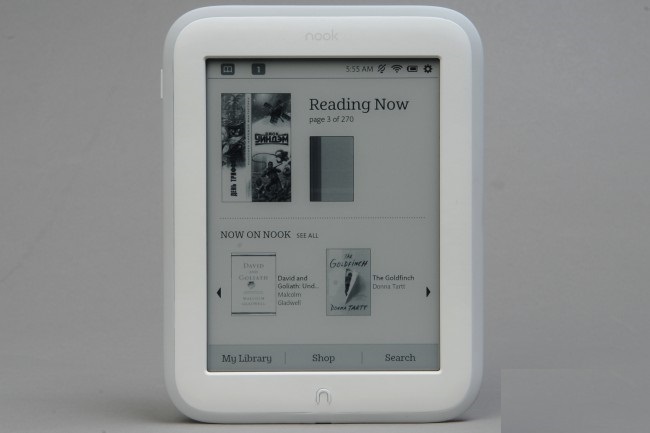 As a result, Barnes & Noble NOOK GlowLight turned out very ambiguous. 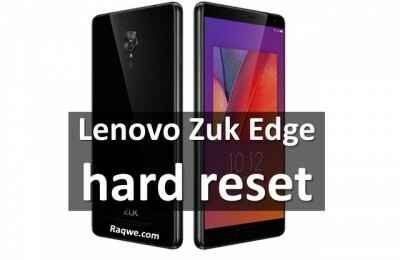 Beginners will appreciate the easy-looking body and backlit screen and high resolution, but more demanding users are likely to remain dissatisfied with the rejection of hardware keys and memory cards, which stands out against the background of previous NOOK reader Amazon Kindle. 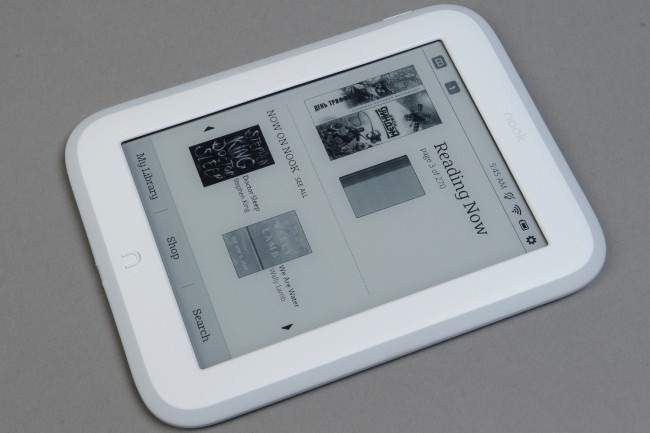 Even without these features the new Barnes & Noble NOOK GlowLight will be unable to compete on the new Paperwhite least because of lower-quality screen, so that the annual battle Kindle vs. NOOK this time clearly won Amazon Paperwhite.